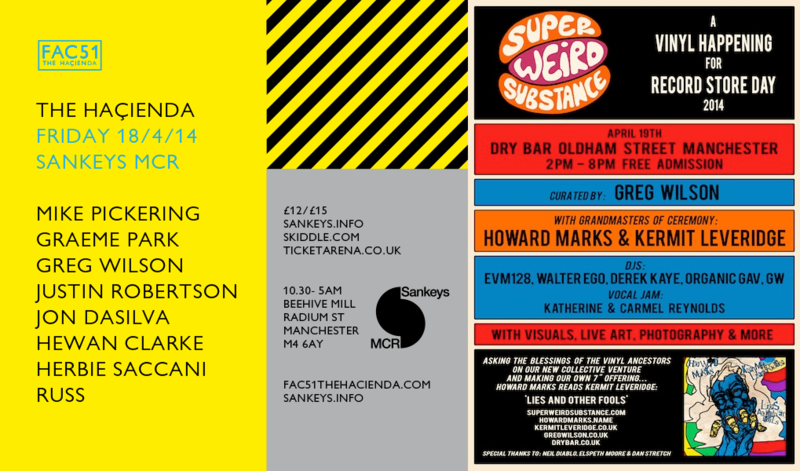 However, it’s Manchester I want to place particular emphasis on in this post, for, apart from the Haçienda night on Friday, I’m also doing something somewhat different to the norm during Saturday afternoon / evening – curating a ‘Vinyl Happening’ at Dry Bar, right opposite Piccadilly Records, to celebrate Record Store Day. Another DJ who rarely receives his proper dues is Jon Dasilva, the Pickering / Park axis often overshadowing his crucial contribution to the Haçienda story, not least via his stewardship of the groundbreaking ‘Hot’ night, that did so much to beckon in the Madchester era. Justin Robertson and I keep popping up on the same bill – it’s happened with increasing regularity during the past year. Whilst he played at The Haçienda in the ’90s, he’s best known for other Manchester club nights, Spice (with Greg Fenton) and Most Excellent, which was a major influence on the Chemical Brothers (then students in the city). Sankey’s, a more recent Manchester institution, is celebrating its 20th anniversary this year. File under strange but true – I was the first person to play at the club, back in 1994, on one of my rare forays back into the DJ realm during my ‘retirement’ period. The following day (Saturday April 19th) I’ll be at Dry, yet another landmark Manchester venue steeped in its own history, for the Record Store Day commemorations. 2014 marks Dry’s 25th anniversary, the bar having been opened by the owners of The Haçienda in 1989. Commencing at 2pm, and continuing until 8pm, the multi-media event will feature Grandmasters Of Ceremony, Howard Marks and Kermit Leveridge, along with a DJs EVM128, Walter Ego, Derek Kaye and Organic Gav (Kendrick). There will also be a vocal jam, courtesy of boss Merseyside singers Katherine & Carmel Reynolds, as well as visuals, live art, photography and more. Big thanks also due to Neil Diablo, Elspeth Moore and Dan Stretch in helping behind the scenes. Presented under the banner ‘Super Weird Substance’, the name of the new label I’m currently busy setting up, which will become operative in the summer. Super Weird Substance will deal primarily with recording and live events, the flagship project being Blind Arcade, featuring collaborators Kermit and EVM128, who’ve been stockpiling a whole heap of dynamite cuts with a good times vibe, many of which will be included on a ‘mixtape’ I’m putting together, which I hope to have in circulation next month. Readers of the blog will be familiar with Kermit. He’s an old friend, dating back to my time at Legend in Manchester during the early ’80s. I subsequently managed Broken Glass, the trailblazing Manchester breakdance crew Kermit co-founded, as well as the Hip-Hop trio the Ruthless Rap Assassins, of which he was a member, and who I also produced. The Assassins broke up in 1991, after 2 albums for EMI, Kermit’s heroin addiction a major factor. He found a suitable drugs buddy in Shaun Ryder of the Happy Mondays, and when the band imploded after their ill-fated 1992 LP ‘Yes Please!’, sinking Factory Records in the process (Kermit contributing a guest vocal on ‘Cut ‘Em Loose Bruce’) Ryder and Kermit began writing together, formed Black Grape, and went all the way to #1 with their debut album ‘It’s Great When You’re Straight…Yeah’ (1995), which also spun-off a hat-trick of hit singles in ‘Reverend Black Grape’, ‘In The Name Of The Father’ and ‘Kelly’s Heroes’. Our collective contribution to Record Store Day is a bit unorthodox. It’s a poem written by Kermit and narrated by Howard called ‘Lies And Other Fools’, which we’ve pressed onto a limited edition one-sided 7” single. 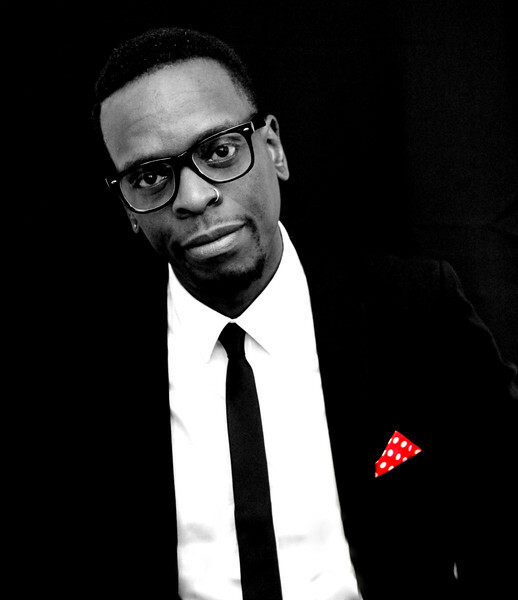 The poem harks back to Kermit’s heroin addiction, which so nearly killed him when he injected with a dirty needle during the Black Grape days, and ended up in a critical condition with septicaemia, the infection causing serious damage when a ball of bacteria ripped off one of his heart valves, resulting in a major operation a few years ago, which, thankfully, was successful in repairing the damage, giving him a new lease of life. Back from the brink, Kermit’s is a tale of redemption – his life now completely turned around with the birth of his daughter, Xian, just a few weeks ago. The distinctive artwork for the single is by Mal Earl, who’s currently working on a comic book version of ‘Lies And Other Fools’ (Kermit a comics obsessive since childhood). 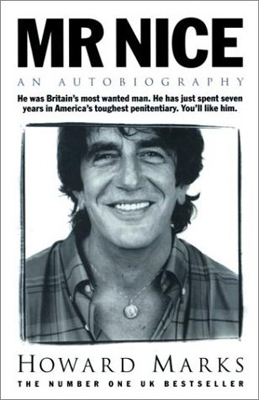 Howard Marks is the infamous ‘Mr Nice’ of the best-selling autobiography and spin-off movie. Formerly a notorious international cannabis smuggler, Marks was eventually convicted in the USA in 1990, serving 7 years in prison. Following his release, and return to the UK, he published his book and instantly became an icon of popular culture, touring the UK and charismatically regaling his captivated audiences with hugely entertaining anecdotes of his dope smuggling past (I myself went to see him speak in Liverpool during the late ’90s). Kermit and Howard first met up a decade ago. When I agreed to get involved with the production of Blind Arcade’s music last year, Kermit told me he had a track he wanted Howard to feature on, and brought him to my house to record the part, my then 14 year old son engineering. Whilst there, Kermit showed Howard the words to ‘Lies And Other Fools’ and he recorded it, off-the-cuff, there and then, his deep Welsh tones bringing a gravitas that was perfect for the subject matter. A week later I was enjoying a family meal when my son asked about Howard, and when he looked him up on Wikipedia his face was a picture as he exclaimed; ‘CIA, the IRA, MI6, the Mafia!’ – he couldn’t believe what he was reading. Having discovered ‘Breaking Bad’ around that time it was as though he’d encountered his own real life Heisenberg. The opportunity to launch this new venture at Dry, a place which connects directly back to the period of time when Manchester was at the very forefront of cultural innovation and expression, perfectly provides that past / present balance that I’m always looking for when embarking on new projects – drawing from what went before, whilst looking forward to what lies ahead. I’ll blog specifically about Super Weird Substance when it’s properly up and running, but suffice to say that there are a handful of releases scheduled for the summer months, with a series of live events throughout the UK being planned for the Autumn. It’s an exciting time for all involved. So, on embarking on this new venture, on making this fools leap, it’s personally important for me to connect back to where my love affair with music began – with the record as we called it, or as people increasingly refer to it these days, vinyl. Needle to plastic, base metal to gold – the philosophers stone. And let’s not forget the mini all-nighter 8.00pm-4.00am Easter Sunday 20-05-14 at the Ritz!